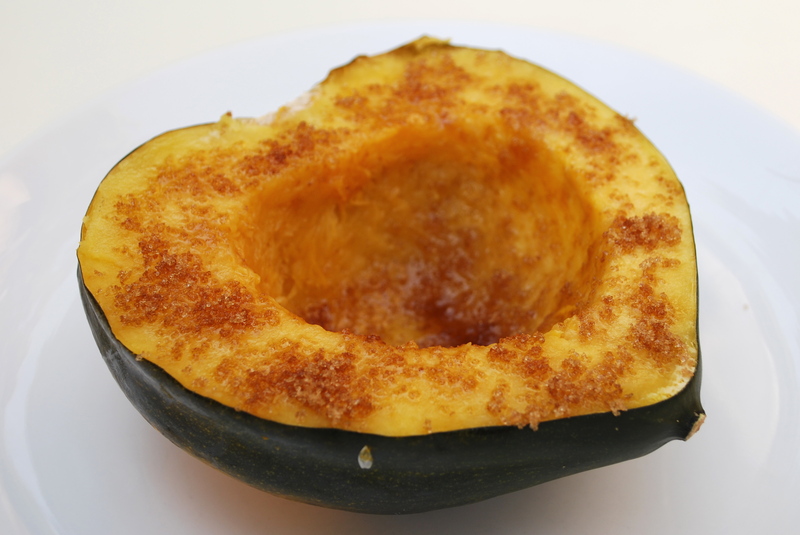 Acorn Squash with Brown Sugar | Time to Cook! This is how my Mom prepared acorn squash growing up. Serves 2 – 4 (2 halves or 4 quarters). Rinse the entire squash and place it in a baking dish, resting in about 1 inch of water. Bake at 350 degrees for 1 hour. Insert knife into squash to make sure it is cooked (knife should slide in easily). Remove squash from oven and let cool slightly on a cutting board. Cut squash in half and scoop out seeds and toss. Top the acorn squash halves (or quarters) with butter and brown sugar. Serve immediately.